Have you heard of sciatica? Of course. It’s like the common cold or any decent ‘trashcan‘ diagnosis for people who want to describe their pain using a more interesting term other than ‘back pain’. The sciatic nerve exits on both sides of the last bones of your spine, or vertebrae. Like all nerves in your body, the sciatic nerve runs like a telephone line down a certain path. In this case, the path is: 1) the lower back 2) down through the glutes 3) down the back of the hamstring 3) into the calf 4) and into the bottom of the foot. Predictable in most cases – down the back side of the body! If it’s not on the path of that telephone line, it’s probably not sciatica. Sensations include pain, electricity, tingling, muscle weakness etc. Abnormal and painful at best. Here’s the important part: Sciatica is a symptom, not a condition. There are *many* different causes of sciatic pain, or pain running down the back of the leg. So what’s the best way to treat your sciatic pain? Depends on the diagnosis! A herniated disc is different than a tight piriformis muscle which is different than stenosis. 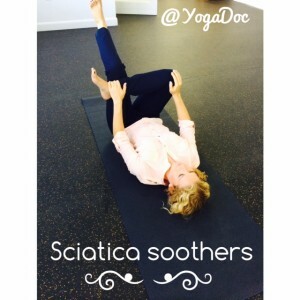 All can cause sciatic pain. For a thorough list of causes visit the page of sciatica guru, Loren Fishman MD. If you have been diagnosed like many desk-dwellers, pregnant women, and runners as suffering from sciatica due to piriformis syndrome (a small, tight muscle under your glute), here are 6 terrific stretches to relieve your discomfort. Still not sure if you have sciatica? Not sure how to treat your pain? Let us help you at our beautiful chiropractic office and yoga center in Aventura, Florida.